The images are based on the theme 'living in nature'. 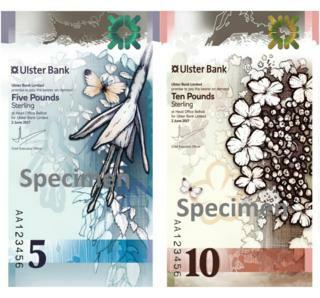 The ?5 note features Strangford Lough in County Down and Brent Geese.Its ?10 denomination shows Lough Erne in County Fermanagh, the Irish hare and Guelder-rose shrubs.The bank announced last year that it would be following the Bank of England by printing plastic money.However, Ulster Bank is going a step further with the new format.Switzerland and Canada are among the few countries that have notes which are vertical in orientation. » What happened to the fivers 'worth?50,000'?